No other Cryo is like Alchemy Cryo. 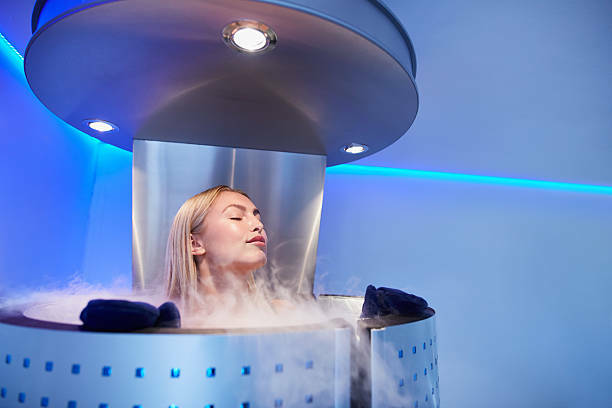 Our world-class Cryotherapy technology is unparalleled in safety and effectiveness. Only Alchemy Cryotherapy Centre offers safe electrically cooled air instead of liquid nitrogen gas for Cryotherapy treatment in Australia. And, it makes all the difference. Our advanced Whole Body Cryo Room has been scientifically proven to achieve a far superior physiological response. With the only Electric Whole Body Cryo Walk-In Room in Australia, we’re here to help you experience results like no other. Electric: breathe fresh oxygenated air that is electrically cooled and dry. Safe to breathe. Safe to treat the whole body. Liquid Nitrogen Gas: breathe liquid nitrogen gas or air that is cooled using liquid nitrogen gas. Hazardous to breathe due to risks of asphyxiation, hypoxia, respiratory problems, light headedness, fainting and other concerns. Reports of liquid nitrogen forced air burns on the body. NB: There is currently a FDA warning against all liquid nitrogen systems. Whole Body Cryo: the use of very cold dry air inside a room to significantly cool the full body including head, neck and shoulders. Partial Body Cryo: the use of very cold air inside a sauna/tube/cylinder to partially cool the lower half of the body while exposing the head, neck and shoulders to ambient room temperature. NB: Other facilities have falsely referred to their sauna/tube/cylinder as Whole Body Cryo. More than 220+ clinical studies. Alchemy Cryo Room maintains temperature below -110°C for the full session duration. Experience the full 3 minutes at the scientifically optimal temperature of -110°C. Whole Body Cooling including head, neck and shoulders. Even cooling of the whole entire body due to the consistent cooling of the air inside the room. Skin temperature reduction measures near the core. Breathe fresh oxygenated air that is dry (NOT liquid nitrogen gas). Whole Body exposure activates Central Nervous System. Multi-person system. Alchemy Cryo Room can accomodate up to 4 people at a time, e.g. yourself + 3 friends. Listen to your choice of music inside the Alchemy Cryo Room. Other systems gradually lower the temperature over the course of the session duration, e.g. from -60°C down to -160°C. Experience less time in the cooler temperatures. Partial Body Cooling since head and neck are exposed to ambient room temperature. Uneven cooling which forces cold air from the feet up and partially cools certain sections of the lower body. Additionally, causing discomfort. Skin temperature reduction may measure near the ankle (if at all). Breathe liquid nitrogen gas, which is sprayed on your body. Reports of liquid nitrogen forced air burns, respiratory problems, light headedness, and other concerns. Thermograms obtained immediately before (a, b) and after (c, d) a Whole Body Cryo session. MORE UNIFORM SKIN TEMPERATURE REDUCTION. 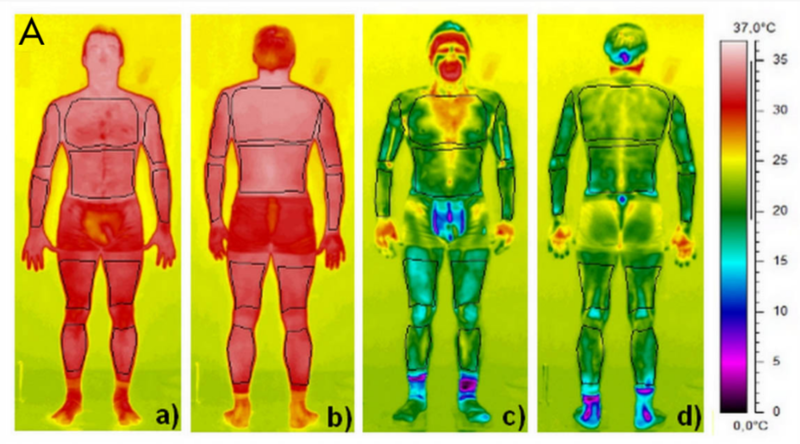 Thermograms obtained immediately before (a, b) and after (c, d) a Partial Body Cryo session. In a clinical study by Dr Hausswirth et al, Whole Body Cryo was scientifically proven to be significantly more effective than Partial Body Cryo. The treatment effectiveness of Whole Body Cryo was supported by thermograms which revealed the skin temperature differences of participants that walked into an electrically cooled Cryo Room which is consistently set to -110°C/ -166F (Group A) and those that used a liquid nitrogen cooled Partial Body Cryo Sauna which briefly reaches -160°C /-256F (Group B). Furthermore, the results of study prove that the markers of treatment effectiveness are skin temperature reductions during treatment exposure (measured in the neck, chest, and quadriceps regions). Whole Body Cryo showed statistically significant increases in activation of the Autonomic Nervous System as measured by biochemical markers in the blood (epinephrine, norepinephrine and dopamine). Therefore, the temperatures of the Cryo systems are irrelevant, e.g. -110°C Cryo Room versus -160°C Cryo Sauna.